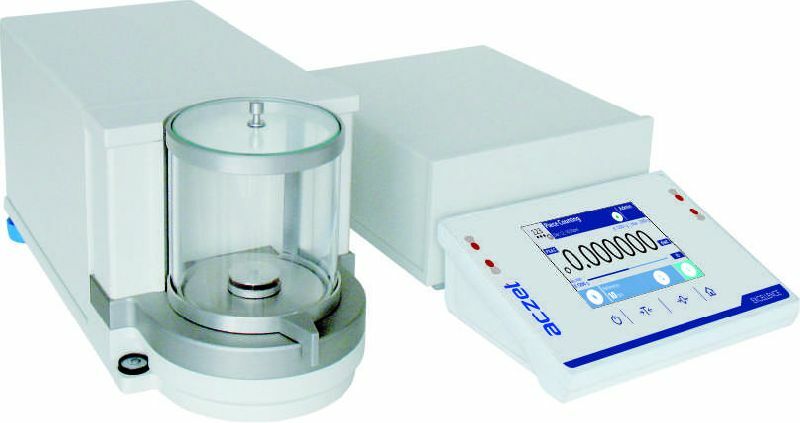 Micro Balance consists of two components - one containing the electronics and the other, the precise mechanical measuring cell, This separation eliminates the effects of temperature an the influence it has on the microbalance scale. Unique & Unequalled high end MONO-TECH technology (Weigh Sensor) to match the highest international standards. When the ambient temperature changes by a specific value or once a defined time interval has elapsed, it performs Internal Calibration. Interface RS 232C Optional USB (Windows direct communication). Capacity tracker built into display for easily monitoring possible overloads. Protection of main balance configuration against manipulation (Manu Lock). ISO / GLP / GMP compliance. The ergonomic two-terminal concept simplifies handling in protected environments and the draft shield design concept makes cleaning easy. Moreover, touch-free sensors reduce the risk of cross-contamination. Short measurement times result in save your valuable time during each weighing operation. 10 different pre-programmed applications ions other than basic weighing ease your routine lab work like, Filling, Statistics, Checking weighing. Percent weighing and Formulation. Work to Place Pharma & Biotech Industry Food & Beverages | Metal, Plastic & Electronics Raw and Precious Materials | Pulp, Paper & Textile Engineering, Machinery & Equipments | Testing Lab. Performance Depending on the installation location and environmental conditions, the value could be higher.